Anchor babies isn't a very endearing term, but in Arizona those are the words being used to tag children born in the U.S. to illegal immigrants. While not new, the term is increasingly part of the local vernacular because the primary authors of the nation's toughest and most controversial immigration law are targeting these tots  the legal weights that anchor many undocumented aliens in the U.S.  for their next move. Buoyed by recent public opinion polls suggesting they're on the right track with illegal immigration, Arizona Republicans will likely introduce legislation this fall that would deny birth certificates to children born in Arizona  and thus American citizens according to the U.S. Constitution  to parents who are not legal U.S. citizens. The law largely is the brainchild of state senator Russell Pearce, a Republican whose suburban district, Mesa, is considered the conservative bastion of the Phoenix political scene. He is a leading architect of the Arizona law that sparked outrage throughout the country: Senate Bill 1070, which allows law-enforcement officers to ask about someone's immigration status during a traffic stop, detainment or arrest if reasonable suspicion exists  things like poor English skills, acting nervous or avoiding eye contact during a traffic stop. But the likely new bill is for the kids. While SB1070 essentially requires of-age migrants to have the proper citizenship paperwork, the potential "anchor baby" bill blocks the next generation from ever being able to obtain it. The idea is to make the citizenship process so difficult that illegal immigrants pull up the anchor and leave. The question is whether that would violate the U.S. Constitution. The 14th Amendment states that "All persons, born or naturalized in the United States, and subject to the jurisdiction thereof, are citizens of the United States. No state shall make or enforce any law which shall abridge the privileges or immunities of citizens of the United States." It was intended to provide citizenship for freed slaves and served as a final answer to the Dred Scott case, cementing the federal government's control over citizenship. But that was 1868. Today, Pearce says, the 14th Amendment has been "hijacked" by illegal immigrants. "They use it as a wedge," he says. "This is an orchestrated effort by them to come here and have children to gain access to the great welfare state we've created." Pearce says he is aware of the constitutional issues involved with the bill and vows to introduce it nevertheless. "We will write it right." He and other Republicans in the red state Arizona point to popular sympathy: 58% of Americans polled by Rasmussen think illegal immigrants whose children are born in the U.S. should not receive citizenship; support for that stance is 76% among Republicans. Those who oppose the bill say it would lead to more discrimination and divide the community. Among them is Phoenix resident Susan Vie, who is leading a citizen group that's behind an opposing ballot initiative. She moved to the U.S. 30 years ago from Argentina, became a naturalized citizen and now works as a client-relations representative for a vaccine company. "I see a lot of hate and racism behind it," Vie says. "Consequently, I believe it will create  and it's creating it now  a separation in our society." She adds, "When people look at me, they will think, 'Is she legal or illegal?' I can already feel it right now." Vie's citizen initiative would prohibit SB1070 from taking effect and place a three-year moratorium on all related laws  including the anchor-baby bill  to buy more time for federal immigration reform. Her group is racing to collect 153,365 signatures by July 1 to qualify for the Nov. 2 general election. Both sides expect the anchor-baby bill to end up before the U.S. Supreme Court before it is enacted. "I think it would be struck down as facially unconstitutional. I can't imagine a federal judge saying this would be O.K.," says Dan Barr, a longtime Phoenix lawyer and constitutional litigator. 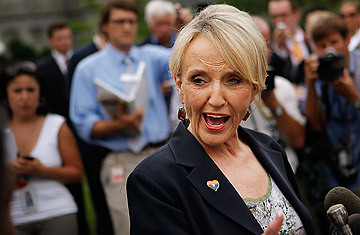 Potentially joining the anchor-baby bill at the Supreme Court may be SB1070, which Republican Arizona Governor Jan Brewer signed into law in April. It is set to take effect July 29, but at least five courtroom challenges have been filed against it. Pearce says he will win them all. Read "Arizona May Target Children of Illegal Immigrants."